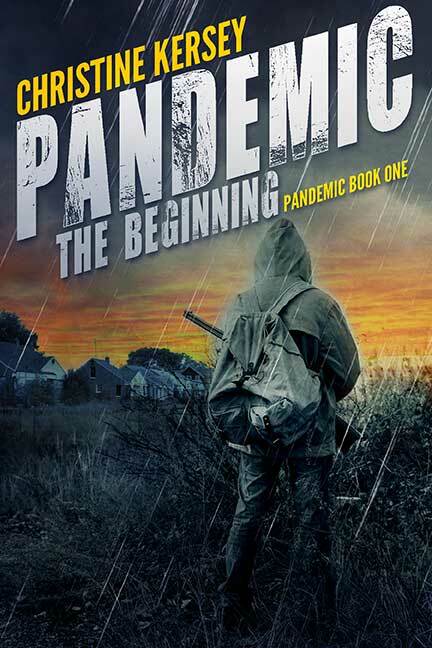 Pandemic is the first book in my new post-apocalyptic series. It is now available! Click on the cover below to get your copy, or scroll down to read the first 12 chapters. The first sign that the world was about to come to an end was when Jessica’s teenaged children informed her that Prom had been cancelled. “Too many kids have the flu,” Dylan, her fourteen-year-old said. Jessica looked at Kayla for confirmation. “That’s because you won’t be able to make out with Ethan now.” Dylan made kissing noises to emphasize his point. “Both of you stop it,” Jessica said. “You’re going to make me late for work.” She loved her job as a dental hygienist, but now that she thought about it, a lot of patients had cancelled due to illness. Maybe her family should stay home for a day or two. Let whatever bug that was going around pass them by. None of them could afford to get sick. Then she thought about Matt, her husband. He’d gone to work already. He was a software developer and Jessica knew he’d been stressed with all the work he had on his plate. Maybe she could convince him to work from home—something he did from time to time. “An emergency that there’s no Prom?” Dylan rolled his eyes. “It is an emergency,” Kayla said. Kayla huffed out a protest, but Jessica knew what Dylan said was probably true. “Woot, woot!” Dylan shouted as he pumped a fist in the air before racing for the stairs. “Do you really think we could get sick?” Kayla asked, her forehead furrowed. “Mom,” Kayla said as she rolled her eyes. Kayla nodded, then she flopped onto the couch with her phone already in her hand. Jessica went upstairs to the master bedroom and closed the door before calling her husband’s cell. He answered on the second ring. Next, she called the dentist’s office where she worked to let them know she wasn’t coming in. “Are you sick too?” Rochelle, her co-worker, asked. Rochelle named several others who worked there. Hearing the names of so many people she knew who were sick sent a beat of concern through her. They disconnected and Jessica set her phone on her bedside table before turning on the news. The anchor went on to another story and Jessica shut off the TV, then used her phone to look up more information. She spent a good hour reading articles about the flu, each one making her concern notch up higher than the last. She hoped Rochelle would change her mind and go home. An image of her mom popped into her head. Recently diagnosed with breast cancer, her mom lived out of state. Alone. Jessica had already arranged to take time off the following week to fly out for a visit. She hadn’t seen her mom in several months and wanted to spend time with her. She and her mom had always been close—being the only child of a single mother did that sometimes. It was important to her to be able to give her mom the support she needed. Briefly wondering if this flu would affect her plans, Jessica shook her head. Surely by the next week the whole thing would have blown over. It had to. “Mom?” Kayla said as she knocked. “But you told him about the flu?” Kayla’s eyebrows tugged together. She seemed much more worried than she’d been earlier. Jessica struggled to come up with an answer. Her phone rang, saving her from having to make something up. “It’s Dad,” she said as she looked at her phone. Kayla frowned, then left the room.